The wedding of Dorothy from Kansas is on everyone's minds these days. This intrepid reporter has had an exclusive interview with our heroine and has all the details! Aunt Em and Dorothy have scoured the magazines and wedding shops looking for just the right dress. They have found just the right pattern and have been sewing for weeks. The dress will not be seen until the wedding, but this reporter has seen it and it is beautiful! It is white satin with layers of white tulle ruffles. (It is the opinion of this reporter that it needs more color, but evidently the fashion in that strange land of Kansas is white for wedding dresses.) It does have a sash of blue gingham made from the iconic blue gingham dress Dorothy was wearing when we first met her. 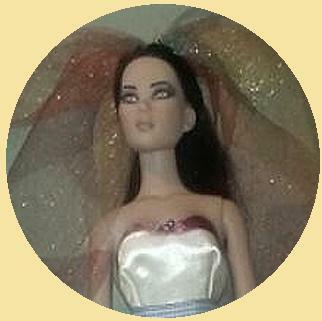 Her veil is also white tulle and has a single emerald pearl from the Emerald City. She will, of course, be wearing the ruby slippers, and Toto will be helping her Uncle give her away. I tried very hard to pry the groom's name from her, but she says it MUST remain a secret for security reasons. She will be bringing her Kansas family over the rainbow for the ceremony. Stay tuned for more news as it happens! This just in!! This reporter was in attendance as a scream came from the Bride's dressing room! We were all in the room as she held the wedding dress up. Aunt Em was stunned. The wedding party evidently dipped into the rainbow as they flew over, and the dress is now much changed. 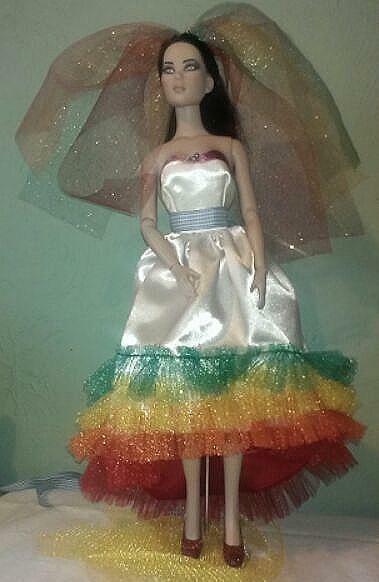 The ruffles are now rainbow colors, and the skirt seems to be lined in red. The sash at the top of the bodice is now violet as are the pearls accenting it. Even the veil is now in rainbow colors! ( This reporter thinks it is very much improved!) The blue gingham sash is unchanged, as is Toto (to his relief). Glinda calmed everyone down and everything is fine. Aunt Em was concerned that the people of Oz would be scandalized that the bride was not in white, but Glinda assured her that the populace knows that Dorothy's heart is pure, and the rainbow would not give up its color to anyone who is not brave and true. This reassured Aunt Em. (This reporter thinks Dorothy may have dipped into the rainbow on purpose, but that is only speculation, as she does not seem to be concerned that the dress is no longer pure white.) Her groom's name still has not been released, so we can only speculate. Is it Scarecrow? The brave Lion? Or Tin Man? Or is it the human boy who was found and raised by the Munchkins after a Tornado in the strange land of Oklahoma? I hear the corn is as high as an elephant's eye there! (Oops, wrong story...) Stay tuned for more news from the Emerald City!